All papers published in History of Psychology during the previous year are automatically considered. The award consists of a certificate and an invitation to present an invited address at the APA Convention the following year. To what extent does the article add to the historiography of psychology? How well documented are the claims made in the article? How extensive is the research? To what extent does the article add to our understanding of historical processes? What does the article articulate about psychological science, praxis, or theory? The selection is made by a committee of three scholars appointed by the President of the Society. Each member serves for three years, with one member rotating off the committee each year. Normally, the person serving for the third year will chair the committee for that year. The committee begins deliberations in May for the volume ending the previous December and continues discussion until a consensus is reached on the winner of the award. If a member of the committee has authored an article in that volume of History of Psychology, she or he will be replaced by the Society President and will return to the committee the following year. The committee reports the winner to the Society President no later than August 1. The winner of the award for the volume ending in December is announced at the Society's Business Meeting at the APA Convention in August. The invited address for the winner would take place the following year. 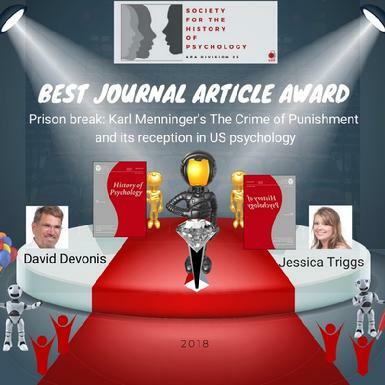 The name of the winner is publicized in the News & Notes section of the History of Psychology journal and on this website. Prison break: Karl Menninger’s The Crime of Punishment and its reception in U.S. psychology. 2000 John P. Jackson, Jr.